Sharla Moody is the first student from River Valley High School to attend Yale University. BIDWELL — One River Valley Senior has been accepted to a school not many in the region have the honor of attending, let alone with a scholarship to almost completely cover the cost. Sharla Moody has been accepted to Yale University beginning in the fall of 2018. Despite the news spreading fast, the news is still surreal to Moody. Her high school career is one of exceptional note, being a national qualifier for National History Day as a freshman, a state science day qualifier as a freshman and sophomore, outstanding attorney in Mock Trial as a junior, the president of the National Honor Society, vice president of the Beta Club, and is her class treasurer. Not only has Moody been highly involved in extra-curricular and academic programs throughout school, she has also excelled in the classroom, earning multiple fives on Advanced Placement (AP) tests, which are scored out of five. 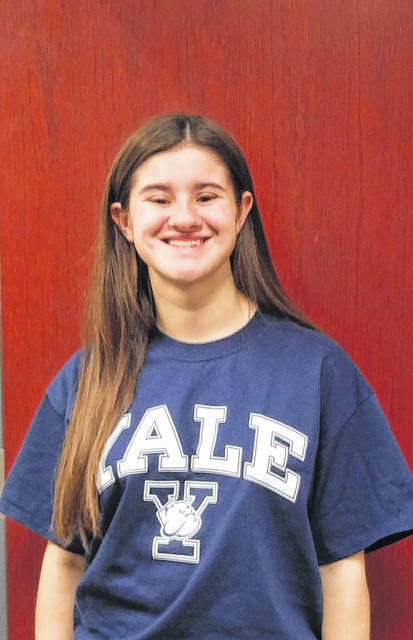 She has a grade point average and ACT and SAT scores high enough to accepted into Yale. In order to be accepted, Moody also had to submit an essay and be interviewed by Yale, as well as have her high school career screened. But what has truly made the acceptance possible was the people around her. Moody explained that she hadn’t intended to apply for Yale, but was inspired to do so by the book “Hillbilly Elegy” by JD Vance, a fellow Appalachian. Moody hopes that her experiences will in turn inspire others students to follow her path, that being from rural Gallia County doesn’t disqualify anyone from attending a top school or achieving success in life. “I feel like it means more to the school than it does to me, it’s obviously very important to me, but I feel like people from the school can use it as an example and someone else will go to a top university,” said Moody. When discussing the benefit of attending Yale, Moody has already had some interaction with other accepted students. ”If I went somewhere in the state there would definitely be people like me there, I’m in a Facebook group of people who got accepted and none of them are like me, they’re all from different cultural backgrounds,” said Moody. She is undecided on her major as of now, but is leaning towards English or global affairs. River Valley, which first graduated a class in 1993, has since had two West Point Academy students, a Harvard graduate, and now a Yale student. “This just affirms what we’ve been doing academically. When we think that our kids can’t do that, can’t go to an ivy league school or a school of a good reputation, that’s not true. They can, and Sharla is a prime example of that,” said Cindy Graham, one of Moody’s teachers. “I still remember Sharla as a junior talking about the possibility of an ivy league school. There is no one more deserving or harder working that Sharla Moody, she is going to do big things,” said Brea McClung, Moody’s AP Government teacher.